The brooch is amazing and very complimentary to any suit. Craftsmanship is adequate to good. Bset Accessories for Women's Dress,Sweater,Formal Clothing and Coat,Blouse. 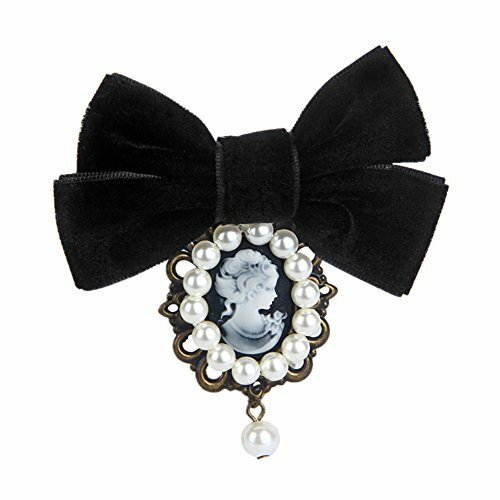 Material:Lint Bow,Victorian lady Cameo,Imitation Pearl. VERSATILE JEWELRY- Size is 3.6" width X 3.4" height.Can also be worn as bow tie on your blouse or sweater. UNIQUE DESIGN:Soft Lint Bow,Vintage Cameo,Beauty Pearl Make Up Chic Brooch. A natural print BURLAP GIFT BAG is free gift for you,randomly selected color shipping. If you have any questions about this product by 80HOU, contact us by completing and submitting the form below. If you are looking for a specif part number, please include it with your message.